This 25-pack of the black 12" Single-Wing Easel Back from Lineco is designed for temporary support of a photograph, sign, or display. Peel away the backing to expose the adhesive on the easel back, which will adhere to the back of the material, and it creates a self-standing display or sign. 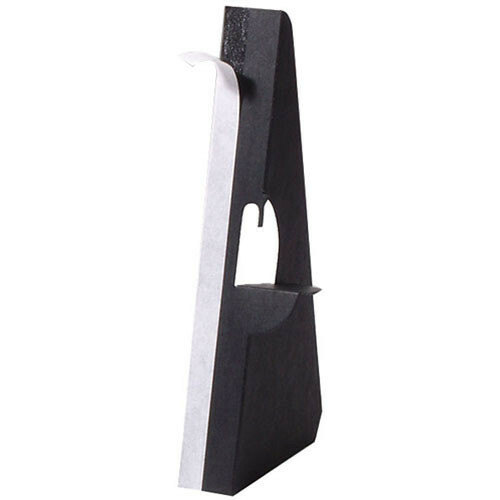 Box Dimensions (LxWxH) 11.7 x 4.6 x 1.0"
12" Single-Wing Easel Back (Black, 25-Pack) is rated 4.0 out of 5 by 6. Rated 4 out of 5 by Anonymous from Great product The only reason I didn't give these 5 stars is because the adhesive isn't always sticky enough. i usually add some double sided tape to make sure it stays secure. Other than that, these have been great for standing up foamcore backed signs. Rated 5 out of 5 by Michele M. from Single-Wing Easel Backs Since we order this to complete a job for one of our clients (we do this job a few times a year) and up to now we have had no complaints; I have to assume the item is performing well and doing it's job. Rated 1 out of 5 by Anonymous from These don't stick! I am a teacher and I like to mount student work on matte board. I thought these easel backs would be perfect, but they keep coming off. They are not sturdy and do not stay. Rated 5 out of 5 by Anonymous from Hard to find item at a great price We work in the art and sign business....We were very happy with the quality and won't need to drive around town anymore. Rated 5 out of 5 by Elizabeth from Great product I love these. Very sturdy. Super fast shipping.